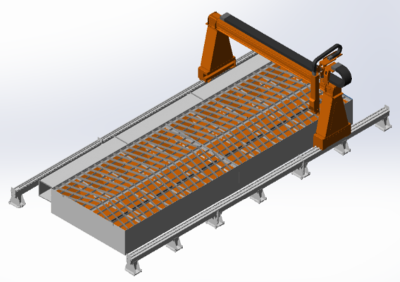 Gantry type cutting system for plasma and oxy-fuel cutting with double-side drive, precise positioning system with rack and pinion on 3 axes and exceptional speed and dynamics. Low backlash, precision gears, as well as highly rigid and precise rail guiding system enable the smooth motion and excellent cut quality in corners and small holes. It is the best choice when cut quality and productivity are of biggest importance. Especially in thin sheet plasma cutting, the system delivers laser-like quality and productivity, thanks to its dynamic capabilities. For applications, where biggest productivity and maximum level of system automation and quality consistency are needed, the software control of the automatic gas console of powersource HPR series of Hypertherm is the answer.